The last (and only) time I made this dish I was pleased with it, but it was more dry than I had expected it to be. That was most likely because I used twice as much cauliflower and potato as the recipe required but did not increase the amounts of the rest of the ingredients. 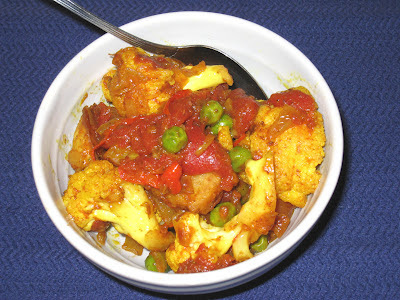 This time, I used the amounts of cauliflower and potato that was called for in the recipe, and even added the extra ounce or two of tomato that was in the jar I was using. I was pleased with the result. The smaller proportion of vegetables allowed the spices to shine in a way they had not done in the earlier version. But I still like the earlier dish. In that one, the cauliflower and potato were the main stars and they were delicious. In this version, all of the ingredients blended together into a more integrated meal that was delicious when scooped up with fresh chapatis. So here is what I have concluded. The earlier version would make a lovely side dish for a meal that featured meat. This version makes a lovely meal in itself, especially when paired with chapatis or rice. I got this recipe from the October 2011 issue of Saveur Magazine. You can find it here. For a drier version that highlights the cauliflower and potato, double those two ingredients. For the wetter, main dish version, follow the recipe as written.